Inside: The easiest way to gain control of the clutter in your life! Full tutorial and inspirational ideas for How to Use Konmari to Organize your Jewelry and Accessories. Jewelry is a very tough thing to organize. We collect it over the course of our lives, it doesn’t tend to ‘go out of style’ and it’s small- so we justify keeping it all. But it can be a pain to store and it can easily get out of control, so today I’m going to show you How to Use Konmari to Organize your Jewelry and Accessories. Konmari is the Japanese art of decluttering, made famous by author and professional organizer Marie Kondo. The method can be challenging because it forces you to examine what you own by holding every item in your hands (or touching it) and determining how much joy it brings you. If you are a diehard Konmari practitioner, you let go of everything you own that does not serve a high purpose (shelter, warmth, food, security) and doesn’t spark true joy. I have written extensively about decluttering and organizing. I’m by no means an expert, but I do have lots of other areas of the home you might want to look into as well. We started our Konmari journey in the master closet and then moved on to decluttering the kitchen. UPDATE: I also recently did a specific Declutter Konmari on my Belts & Scarves. So how do you use Konmari to sort through and declutter jewelry? It’s the same basic principle as any other Konmari endeavour. Here are some quick tips to help you get started. Immediately sort and identify the broken pieces that cannot be repaired. Earmark them as toss. Sort the remaining based on what you wear often, what you haven’t worn in the last twelve months and what you never wear, but to which you are sentimentally attached. Now that you have the basics done, you need to re-sort your jewelry in order to organize it. You’ll probably end up with two separate piles. Let’s tackle the ‘sentimental’ pile first. These are pieces that might be heirlooms and that you don’t want to toss, but they don’t need to be at the forefront of your everyday organizing strategy. 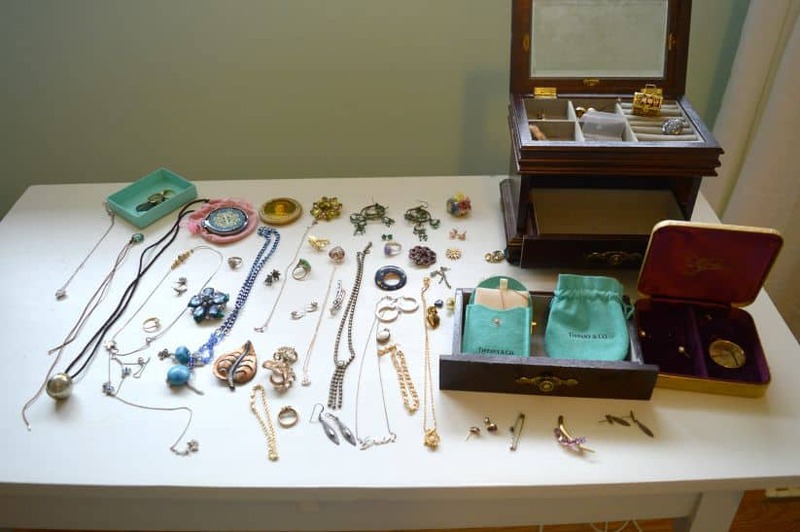 You can sort heirloom or sentimental pieces in a separate jewelry case that you keep in a closet or drawer. Or you can also buy small velvet jewelry bags to keep them scratch free. Do this first, as it will help you mentally clear some of what’s in front of you before moving onto what is likely the larger pile of jewelry left to declutter. The remaining jewelry should be stuff you wear everyday or have worn in the last year or so. Spread each piece out individually and make sure it’s all tangle and knot free. Now we are going to figure out how to store it all properly! I think most people are looking to create more space when they organize jewelry and so, hanging it on the wall in some capacity is a great way to make more space and keep things looking crisp and organized. I’m a big fan of Hanging Organizers. In fact, you can check out my simple DIY Hanging Necklace Organizer if you need inspiration. I pulled it together in a couple of hours, using very basic supplies. It’s hanging on the wall using Command Strips and it definitely ensures I wear my jewelry more often. I’m also absolutely bonkers for this wood and brass version of the same type of hanging wall organizer. It’s gorgeous and bit more sophisticated than mine. It would look stunning in an urban loft or apartment, don’t you think? If your stuff is a bit heavier (think chunky necklaces and beaded items), you might need a storage solution that can hold a bit more weight. For situations like this, I’d turn to an over the door jewelry rack or organizer like this one. It is made of metal, so it can accommodate lots of types of jewelry hooks and it will take more weight than something that is tacked to the wall. If you have enough space on a dresser, vanity or bathroom counter, you might want to consider using a tiered tray to sort all your jewelry. These keep things very accessible and are a great place to drop your rings, earrings and hair clips at the end of a day. I love this wood and felt tiered tray. It’s sleek and folds up if you need to clear more space! You might also consider using a tray that doubles as a vanity or makeup mirror! I’ve got one in my master bathroom that I use to coral my everyday jewelry, hair clips and makeup. It works really well and it’s pretty to look at. For more about this, you can see how I organized my bathroom countertop in just ten minutes! If this hasn’t been enough organizing for you – and if you have another big project to tackle, I recommend looking at your linen cupboard. It is another area of the home that gets out of control easily, but is simple to purge, sort and declutter. In fact, I did my entire linen cupboard (including installing new shelves!) in just half a day. This post contains affiliate links for your convenience. Please see our full privacy and disclosure policy. Oh friend, I found myself nodding my head as you talked about your Grandma’s jewelry … I wrote much of the same about my journey with my jewelry too and chose to keep it (in a little pouch) as well! Most definitely #SparkingJoy! Crack me up! It’s so funny the little shampoos, shower caps and soaps that we actually think we will use “someday.” Wonder if we forget that the next time we travel, those things will likely end up in our luggage…again. LOL! Great post, wish I had some trinkets of my grandmother’s. You’re very lucky. My grandma just passed away do I had a rough time with her jewelry because she kept everything and most of it was bad Avon…but I feel this. I kept my Lion King Earrings from when I was nine and the horrible heirloom “pearls” I wore to get married. Have you thought about framing your grandmother’s jewelery, maybe in a shadow box? Then you would see the actual pieces everyday not just the pouch.